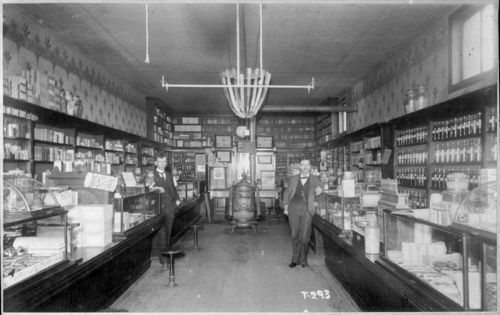 This photograph shows an interior view of the William Henry Wilson Drug Store, located at 414 East 4th Street in Topeka, Kansas. There are two men visible standing in the store, and the man on the right is identified as Mr. Wilson. Several display cases and shelves are visible along the sides of the store, and bottles of chemicals and pharmacy supplies are visible on the shelves. A sign on a display case on the left side reads, "Dr. Williams Pink Pills for Pale People." A heating stove is also visible towards the back of the store. Holding Institution: Florence R. Wilson, 1964.